INISH Cycling Club and friends have pedalled 100 miles around the peninsula raising more than €3,000 for local charities. The funds from the Inishowen 100 (i100) challenge were divided between Ard Aoibhinn Alzheimer's Unit, Carndonagh and Zest Healing the Hurt, Derry. 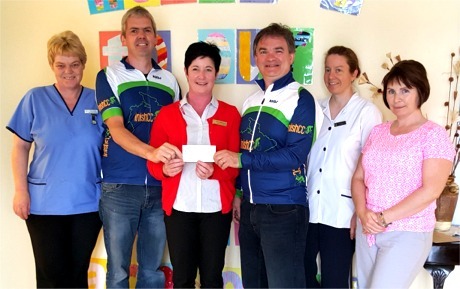 Members of Inish Cycling Club present a cheque to help support Ard Aoibhinn Alzheimer's Unit, Carndonagh. The club issued a heartfelt thanks to everyone who helped make their recent fundraising event so successful including the Ballyliffin Hotel and Philomena at the Wee Hall in Culdaff for facilitating the food stops. "This year again the support of Seamas and Terry McElvaney was invaluable as was that of Paddy Gillespie. Their generosity and good humour is not taken for granted," said a club spokesperson. "The club want to thank especially Michael McDaid who captured the day again for us so perfectly. Of course no journey can be completed without sustenance, here a special mention to Caroline and Donna, the lunch ladies and not forgetting the tea ladies, Louise, Elly, Marylou and Joan. "A final word of thanks to the cyclists and their sponsors who really made the day a success through their combined determination and generosity." The club is already getting in gear for next year's challenge on Saturday, May 6, 2017.